A man of appetite and energy, John Hilton had an outsized persona and knew how to use it. He is arguably the most famous name in the Smoketree School, not for his paintings alone but for showing the others how to act like a desert artist. John Hilton and Kathi Hilton. Courtesy of Bodega Bay Heritage Gallery. The man is so legendary as to be nearly untouchable, but now you have a chance to come closer via his daughter, desert painter Kathi Hilton Garvin. A show of Kathi’s work opens on Sunday, September 2, 2012 at the 29 Palms Art Gallery. The artist is traveling from her home in Utah for the event. 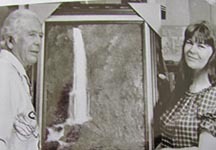 John Hilton, who died in 1983, was friends with Agnes Pelton, Clyde Forsythe, Maynard Dixon, Bill Bender, Nicolai Fechin, Desert Magazine editor Randall Henderson, Zane Grey and many others. Kathi, too, knew many of her father’s famous friends. Still, anyone can accumulate a Rolodex. It was the things Hilton did–and was always doing—that made him so large. He scouted for General Patton, sang in Cahuilla, played the ukulele at an artist’s camp at the Salton Sea, mined for Calcite in Borrego, captured rare snakes and Gila monsters, ran his Gem and Art Shop at Valerie Jean and lived with a poltergeist named Felicia. Hilton’s paintings are instantly recognizable for their pinks and pastels. His daughter, born in Indio, paints in a similar textured, light-filled style. The venue for the current exhibit couldn’t be more fitting. The 29 Palms Art Gallery, in a circa 1936 adobe, was founded by eight desert artists—including former 29 Palms resident John Hilton. Opening reception Sunday, Sept. 2, from 12-3 pm.